About Hendrik Andriessen (1892-1981), Louis Andriessen (b. 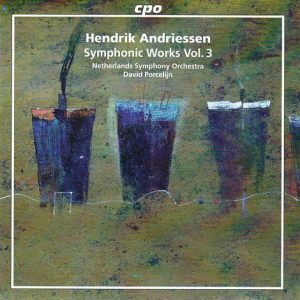 1935) and the father-son relation, see my Hendrik Andriessen presentation page or my review of volume 1 of this valuable 3-CD survey of his symphonic output on Cpo. The point is that, while the great success of Louis, starting in the late 1970s with works like Hoketus, De Staat and De Tijd (Time), has all but obliterated the memory of his father even among music connoisseurs and fans of 20th century music, from the 1930s (and his Kuhnau Variations for strings, featured on vol. 1) to 1970s Hendrik was the recognized composer, and this series gives us a welcome opportunity to reassess his work. The impression derived from volumes 1 & 2 was that of a composer not bound to a single style, going from Roussel (for whose music he professed great admiration) in the first symphony from 1930 (but a mixture of the late-Romantic Roussel of Symphonies Nos. 1 & 2 and the motoric Roussel of Symphonies 3 & 4) or even D’Indy in the 1947 Ballet Suite, to Schoenberg in the Symphonic Etude from 1952, based on a Schoenberg-inspired twelve-tone melody (all on volume 1) – and back, as in his Mascherata, from 1962 (volume 2), four movements in “scherzando” vein paying homage to Commedia dell’Arte and harking back to Roussel or Dukas’ Sorcerer’s Apprentice: and what was hardly cutting edge but, still, of its time in the 1930s, must of sounded hopelessly backward-looking thirty years later. The music was always enjoyable, often dramatic, sometimes rising above the stock and trade of its time (Kuhnau Variations, First Symphony, Symphonic Etude) but also lacking a truly distinctive personality. Sometimes, in the combination of powerful drama and lyrical accessibility, Honegger came to mind, but you can recognize a work of Honneger within two bars: not so with Andriessen. 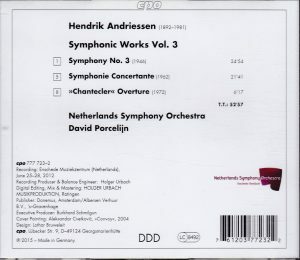 Impression confirmed again with volume 3: the Third Symphony is very dramatic, filled with an agonized lyricism in its slow movement, but it is couched in a romantic style that, by 1946, seems to be looking 20 or 40 years backward rather than forward. The final movement in fugal form, also intensely dramatic, could be Hindemith, but without the immediately recognizable style and personality. Symphony concertante is more a Concerto for orchestra in which different sections assume in turn a solo role, and again its combination of lyrical sweep and drama evokes to me the music of Honegger, although the style is more generic than Honegger’s. The slow movement is a series of variations in neo-baroque style on a theme from Adriaen Valerius’ famous (in the Netherlands) Neder-lantsche Gedenck-clanck , a collection of beggar- and soldier songs published in 1626 (not 1623 as the liner notes say, confusing with another collective collection to which Valerius participated, The Zealander Nightingale). And if Symphonie concertante could sound passé in 1962, what about the Chantecler overture of 10 years later! Inspired by the play of Edmond Rostand (more famous today as the author of Cyrano de Bergerac) about a rooster, it is colorful, evocative, ironic, boisterous, but again it could have been written 40 or 50 years earlier. You can’t help thinking that there was a message in Andriessen’s choice of Rostand’s play: re Wikipedia, “The play centers on the theme of idealism and spiritual sincerity, as contrasted with cynicism and artificiality. Much of the play satirizes modernist artistic doctrines from Rostand’s romaticist perspective.” Andriessen’s music is always enjoyable, if you enjoy 20th-Century “conservative modernism”, it isn’t blatantly neo-romantic/nostalgic either in the style of, say, David Diamond. But if I have to offer a tentative explanation of why Andriessen fell in relative obscurity after being so popular in his lifetime, it is, first, that he was still writing in the 1960s and early 1970s as he had been and would have in the 1930s, which by then was very passé, and that his style his very generic, is isn’t uniquely personal as, in many different styles (and without trying to be exhaustive), the music of Stravinsky, Hindemith, Martinu, Honegger or Britten. TT 53 minutes. See also my reviews of volume 1 & volume 2, and for more music and CDs of Andriessen, go to my Andriessen presentation page.